On the back cover, Kim Stanley Robinson calls this book “a masterpiece of scientific writing for the general reader” and Ray Bradbury describes the beautiful combination of text and pictures as “superb.” The book indeed lives up to these superlatives. 2. An underlying theme, ever-present in the book, is how we know what we know about Mars. Whenever conclusions are reached, the lines of evidence, and their strengths and weaknesses, are always presented. This not only makes the subject matter more clearly understood, but it gives the reader good insight into the scientific method as it applies to the study of Mars. 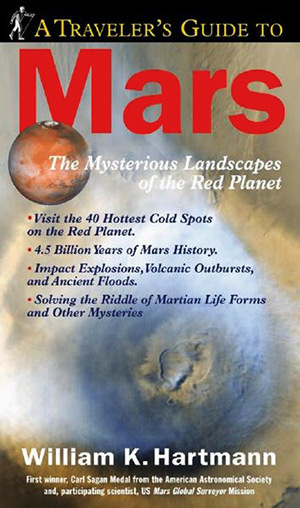 For example, in his treatment of Martian meteorites, the author describes what they are, how we know they came from Mars, what they tell us about Mars, and how data obtained from the meteorites combine with data obtained from spacecraft to give us a more knowledgeable overall picture of Mars. 3. Another underlying theme is how the study of Mars is a human enterprise: the craters are laboriously counted by humans, the spacecraft are built and controlled by humans, the interpretations of the data are argued over by humans. This story too is seamlessly woven into the main body of the text as well as presented in personal vignettes about the author’s own extensive experience in the study of Mars. 4. The book is profusely illustrated with over 200 photographs, a large majority of which are taken by spacecraft either orbiting Mars or landed on its surface. There are also some photos of Earth features which shed light on their Martian counterparts, and even a few paintings by the author. Each illustration helps tell the story. In short, this book has it all — the landforms, the geology, the science, the human enterprise, and lots of great illustrations — all masterfully integrated to produce an exciting read. If you would like to get to know your planetary neighbor, you simply will not be able to find a better introduction than Bill Hartmann’s A Traveler’s Guide to Mars.